With 11 traditional and familiar Christmas songs and 1 original this Americana style instrumental CD will brighten your Christmas season. It is a very special time when father and sons work together as a team to accomplish a common goal. I am so blessed to be able to work with Matthew and Daniel on this Christmas CD. They are wonderfully gifted musicians and it was such a joy to hear these favorite Christmas songs come together in the studio as we played, arranged and recorded this CD. " 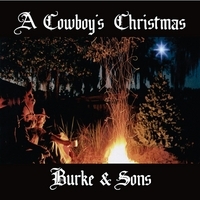 A Cowboy's Christmas" takes us back to a time when families worked together, life and music was not so complicated and Christmas was about Christmas. My wife , Cheryl did a beautiful job on the photography and my sister, Michelle helped us with the photo editing. Matthew also did the graphics for the CD cover. I hope you enjoy this family effort and share these wonderful Christmas songs with your family during this joyful and sacred holiday. Merry Christmas !